Rochester Falls is set in a rugged, wild and lush green landscape in the Savanne district of Mauritius, just some 2.5 kilometers away from Souillac (South of Mauritius). 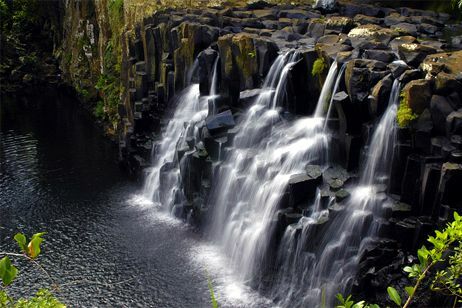 A must visit tourist attractions in Mauritius; the Rochester Falls has been in the spotlight for being featured in many Bollywood movies. One of its main features is the unique and dramatic cliff face which has been transformed into jagged rectangular blocks by the force of powerful water over the past hundreds years. One interesting fact about the name of the Rochester Falls is that it was first inspired from the novel ‘Jane Eyre’ by Charlotte Bronte which was published in 1847. During the colonial period, the name ‘Rochester’ was given to the Domain where these falls are currently located. The cascading waters tumble from a height of 10 meters through the rocky beds of the Savanne River. Mesmerizing as it may seem, this spectacular sight serves as an ideal spot for a quick refreshing plunge or a small picnic break. The breathtaking scenery, cascading waterfalls, pools of clear water, and luxuriant greeneries surrounding the region, makes it a wonderful site to see and a relaxing experience. You might also meet some daring and adventurous locals who are willing to jump from high above the cliffs to the pool of water which can be fatal, yet these are daring experts. How to get to Rochester Falls? There are two access points; one at the top of the waterfall and another which leads you to the bottom. The rugged terrain can be quite challenging as you drive or walk to the waterfalls, yet it is definitely worth the effort. The routes to the waterfalls are indicated with signs so it should be fairly easily to locate. One of the bumpy paths will lead you to the middle of a vast sugarcane field to walk through until you find yourself at the top of the waterfall. The other path is rather circuitous and is a rough ride along the stone-strewn track. As you make your way you will find a graveyard on your left and eventually a farmland with rough paths. Eventually you will see the waterfalls hidden behind the huge trees-simply incredible and rejuvenating! Both paths are perfect for the adventurous at heart and for those who fancy hiking. It is advisable to avoid visiting the Rochester Falls during the heavy rainy seasons (beginning of the year) since the water level and torrent can reach at dangerous levels. Consequently, water becomes muddy at times and also makes the area quite muddy and slippery. Beware of the mosquito bites as well; it is recommended to always bring your mosquito repellent with you. Looking to visit Rochester Falls? The best option is by booking the customized day tour offered by MauritiusAttractions which will take you to many of the best sites on the island, including also Rochester Falls.